Containing over 100 delicious and easy-to-prepare recipes, Amelia equips you with the skills and knowledge to improve your health while empowering you to cook with confidence. A professional nutritional therapist, she promotes a gluten, refined sugar and dairy-free lifestyle in favour of endless fad diets. Amelia is a firm believer that absolutely everybody can cook delicious, healthy, beautiful food. 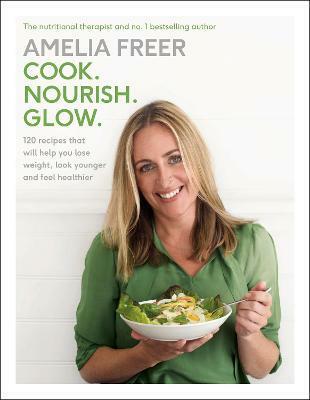 Many of us feel pressure to be perfect in the kitchen but with Amelia, anyone can learn how to assemble nourishing food in minutes using fresh ingredients that will transform how you look and feel. Be inspired to cook yourself healthy with Cook. Nourish. Glow.